As a fast increasing number of SaaS/Cloud companies are discovering, the sea-change in the industry is far from over. The shift in profit realization strategies from the sale of perpetual licenses over to the subscription model has made customer retention a mandatory requirement. The signing of the first contract is a only a milestone, not a resting place. “Shelf-ware” or underutilized products is no longer an option. As a result, software vendors are now realizing that in order to keep their customers, they must take a far more proactive role in ensuring the success of those customers with their technology. But understanding that customer retention is a year-around effort, a commitment that requires a dedicated and accountable executive, is only the beginning. There is much more to Customer Success Management than just establishing a new box in the overall corporate organization chart. What do Customer Success Managers do? How should the CSM team be chartered? What access channels and technologies are needed? Where should a company look for skilled people? How should the individual and group performance metrics be connected to the strategic goals and objectives of the company? 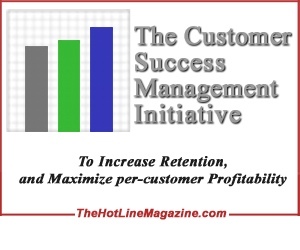 What is The Customer Success Management Initiative? Sponsored by CSM technology vendors Apptegic, Jbara Software and Totango and media sponsors Sand Hill Group and The HotLine Magazine, the purpose of The Customer Success Management Initiative is to gather data and insight on what SaaS/Cloud companies are actually doing about the new role and profession. Through two online surveys, direct interviews with CxOs and CSMs, online conversations in the CSM Forum and review of a wide range of published material, an initial view of the current-state of Customer Success Management has been developed. The first Report is being written, and will be published in early March. A presentation of the material was delivered in a webinar, made possible by Citrix OnLine, held on Thursday, February 23rd. If you weren’t able to attend the webinar, you can access a copy of the Report when it is published later. This article will be updated when the Report is available. Does Your Company Have a Customer Success Management Group?